Parry, aka Lidia Paranoid, is a big handsome 3½-year-old black male born October 21, 2000. His sire is Unruly Thomas and his dam is Lidia Pineapple. Parry raced in Texas, Wisconsin and Iowa from July 6, 2002 until January 27, 2004 before a torn Achilles tendon retired him after 63 races. His injury has healed and he is receiving daily physical therapy from his foster mom for a little while. 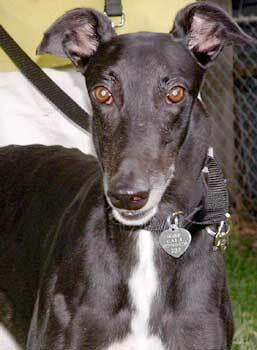 Parry is living with another greyhound and several indoor cats, so is cat and small animal tolerant.